OCEANSIDE — The Libby Lake Community Resource Fair was a bright spot for a community that had two neighborhood teens fatally shot and two injured at Libby Lake Park in March. The Neighborhood Services Department, police, firefighters, Save our Streets community group, Vista Community Clinic, and North County Lifeline joined other groups to give the neighborhood a day of fun and share information on community services May 11. “Since the shooting, the community has been quite hesitant about spending time at the park, which is pretty sad considering the fact that Libby Lake Park probably has the most beautiful scenery over any other park in Oceanside,” Jimmy Figueroa, REACH project coordinator for Vista Community Clinic, said. The Resource Fair has been held for numerous years. This year the goal of the fair was to give the community a positive day in the park. 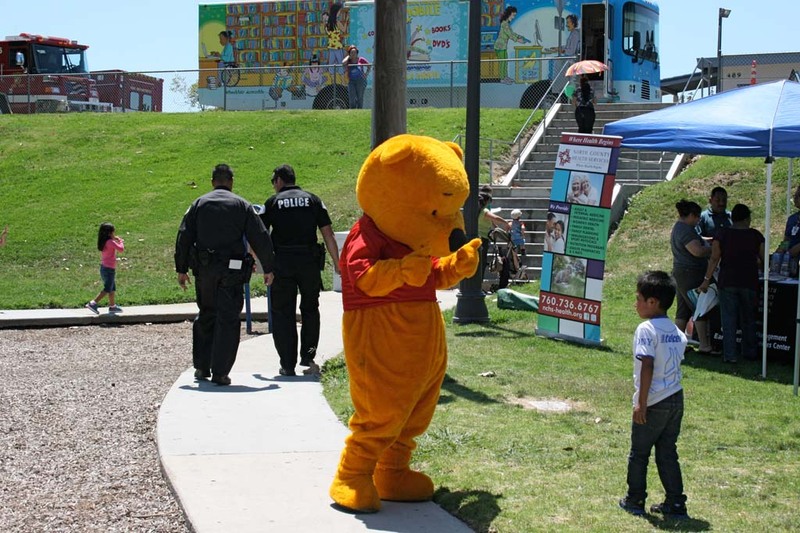 “The resource fair usually takes place on the street, but the city wanted to use this opportunity to welcome the community back to the park and demonstrate to them that this park belongs to the community,” Figueroa said. “It’s a day for everyone to enjoy,” Louie Chavez, resource manager of the Libby Lake Community Center, said. Ballet folklorico dancers, mariachi music, a Ronald McDonald magic show, a giant inflatable slide, free balloons and a kids dance contest were part of the fun. Firefighters and community police officers had an opportunity for some one-on-one time with residents and kids to share crime prevention tips, pass out stickers and coloring books, and show children how to fish. “When it’s one on one they feel more comfortable coming up to us,” Dolce Fish, police crime prevention specialist, said. “It’s a great event. We just want to be there and have fun with the kids,” said Fish. In addition to the community fair, park trees have been trimmed and vegetation has been removed from hillsides to provide clear visibility. Regular monthly community meetings between residents, community groups and police continue to be held at Libby Lake Community Center.